This started as a full-colour digital image to which I applied three B&W split-toning layers (with masks on different parts of the image). Split-toning is possible in the traditional darkroom, but the range of tones that can be reliably generated is much smaller, and the process is a lot less predictable. 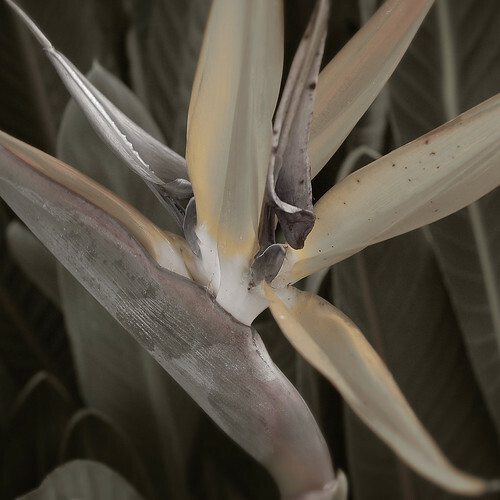 Anyway, this flower is called a “Bird of Paradise”, and I found it in full bloom along a main street in downtown Naples, Florida. I just returned from a short trip to sunny Florida with a whole bunch of digital shots in tow, including a mess of infrared images. Here’s one to whet your appetite.